Thinking of running a marathon or half-marathon? Maybe you are looking to take part in a swimming, cycling or triathlon event? Whatever your sporting challenge, do it for IN-vision. Get in touch now and we will help you all the way. One of the most popular ways to fundraise is to run a marathon or half marathon and get sponsored for doing it. 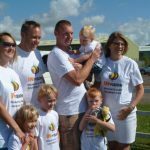 It’s a great challenge but a rewarding experience and even more so if you raise money for IN-vision. Get on your bike for IN-vision! In 2013, IN-vision was one of three charities supported by the Marlow Red Kite Ride, in association with British Cycling. IN-vision was supporting on the day handing out refreshments. Maybe you’re more of an adrenaline junkie, or you just like more alternative sports. Skydiving? A bungee jump? What about Rally driving? Whatever your sporting challenge take part for IN-vision. Paul Franks and Adam Collins jumped out of a plane at 15,000 feet for IN-vision. 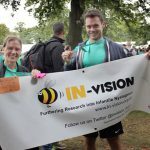 They raised nearly £2,000 for IN-vision. Huge thanks to them both and to their families for all the support. 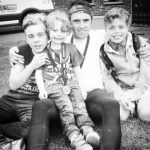 A very proud and exhausted Simon Weaver-Poole and sons after Simon finished the London 2 Brighton Ultra Marathon in just over 12 hours, coming 28th and raising over £600 for IN-vision. Absolutely fantastic Simon! Monica Manzinni with her medal at the finish of Run to the Beat, London’s biggest half marathon, in September. Well done Monica! 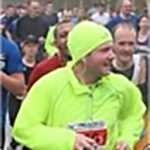 Chris Bevan ran in the Reading half marathon, March 2013 for IN-vision and Nystagmus Network – despite the terrible conditions! Nice one Chris! 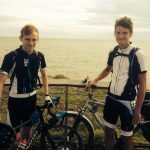 Oliver Gillen-Toon and Robbie Cleave took to the saddle in August 2014, cycling from Windsor to Bordeaux in just 6 days. We are hugely grateful to them for raising over £600, all of which will go directly into funding research.